For five days, from May 23rd to 27th, and 14 years after the 1st World Fisheries Congress in Athens, Greece, the 7th World Fisheries Congressvisited Busan, the second largest city of South Korea. The venue was hosted by the World Council of Fisheries Societies and took place at the Busan Exhibition and Convention Center (BEXCO), where 498 presentations divided into 36 sessions addressed the common theme of the conference: the Challenge to Sustainable Fisheries and Safe Seafoods. The conference was inaugurated by an opening keynote session on May 23rd where visitors and participants were welcomed by an astounding drumming performance and a series of brief welcoming statements from representatives of the organizing bodies of the event: The Korean Society of Fisheries and Aquatic Science, the Busan Metropolitan City, and the Ministry of Oceans and Fisheries. The presence of Nereus researchers was acknowledged from the very onset of the conference. 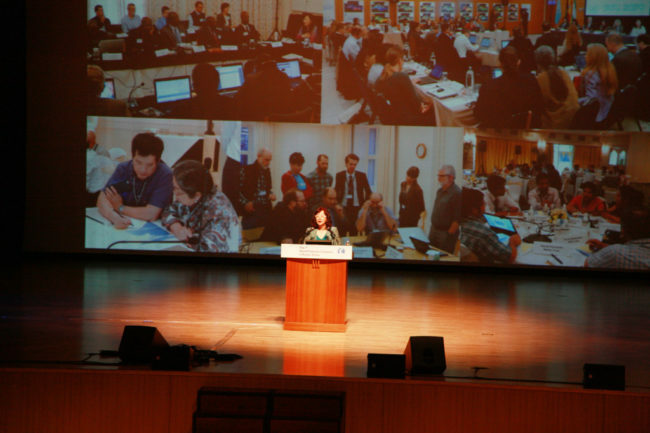 In her opening keynote speech, Jihyun Lee (Environmental Affairs Officer of the Convention of Biological Diversity), acknowledged the work of Senior Nereus Research Fellow Daniel Dunnand his laboratory at Duke University in the conservation of ecologically or biologically significant areas across the world’s oceans. Jihyun Lee, Environmental Affairs Officer of the Convention of Biological Diversity, gives a shout out to Fellow Daniel Dunn and the Duke University laboratory at the World Fisheries Congress. Credit: 7th World Fisheries Congress. 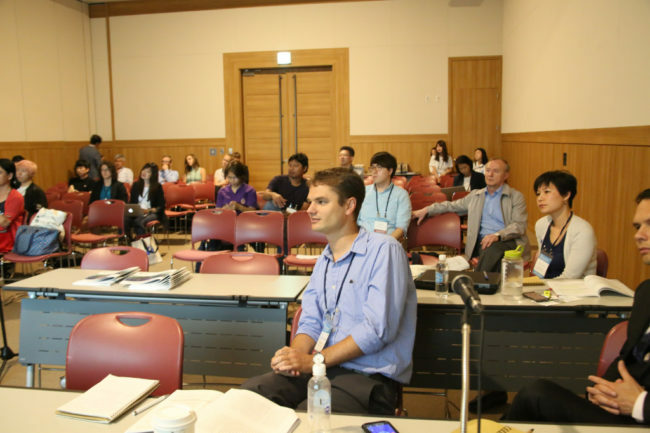 Each day of the conference began with exceptional keynote interventions from renowned professors and members of scientific institutes worldwide – such as the National Institute of Fisheries Science of Japan – who through their speeches taught, or reminded, the attendees about the importance of topics as different, yet complementary, as fish cognitive behavior, state of global fisheries or fish genomics. The participates were then invited to attend any of the multiple concurring sessions throughout BEXCO, as well the poster sessions which were run parallel to the coffee break every morning and evening. The Nereus delegation participated in three sessions (Session 5, 9 & 18) and was entrusted with the responsibility of organizing and running one of them, Session 9, on the Future of Marine Fisheries under Climate Change: Exploring Uncertainties, Future Scenarios and Multi-scale Transformative Pathways. The Nereus team was comprised of 10 researchers which included Program Managers and Principal Investigators as well as Nereus Fellows and Alumni from five institutions. Through the diversity and relevance of their talks, the Nereus delegation reaffirmed both the interdisciplinary nature of the Nereus Program and the role that Nereus research can play in informing many of the fisheries-related challenges that society is facing nowadays. Nereus was not only present throughout the sessions of the congress, but was also very active on social media platforms, primarily through live tweeting, where researchers and institutions exchanged impressions on the research findings being presented. The Nereus Program-organized session at the World Fisheries Congress — “Future of Marine Fisheries under Climate Change: Exploring Uncertainties, Future Scenarios and Multi-scale Transformative Pathways”. Credit: 7th World Fisheries Congress. 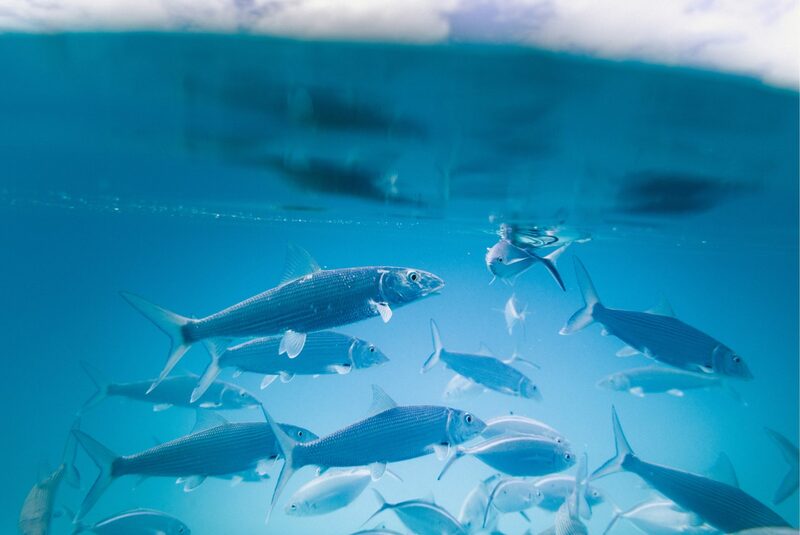 Exploration of possible adaptation and/or transformative pathways that can lead to sustainable development in the ocean under climate change. The presenters of the 21 talks in Session 9 were invited to participate in the creation of a document which summarized the main findings of the research which they presented during the session; this was a unique initiative led by the organizers of Session 9. 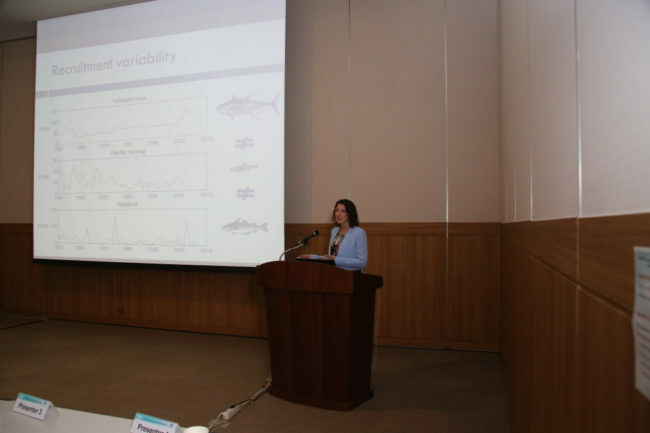 Nereus Fellow at Princeton, Colleen Petrik, presents at the World Fisheries Congress in Busan. Credit: 7th World Fisheries Congress. The 7th World Fisheries Congress was brought to an end with a closing keynote intervention on the state of the world fisheries, which sparked enough debates among the attendees to ensure that the 8th World Fisheries Congress in Adelaide, Australia, in 2020 will be bring with it the latest research to help us tackle our common Challenge to Sustainable Fisheries and Safe Seafoods.